Far better than its title suggests. the song back from me is the second verse, which treads water by focusing on the jukebox instead of the conversation at hand. But redemption comes with a solid bridge and beautiful final chorus. The production does such a great job of not getting in the way of the song. It makes me wonder how many more of today’s country songs I would like if I was able to hear them without interference. If the singer here believes in Jesus, the producer here believes in his singer. I don’t know that many souls will be saved by “Beer with Jesus”, but if Nashville listens to it carefully, they might learn something about saving country music. Retro Single Review: Dolly Parton, "The Seeker"
Not a bad song, and a nice low-key production, but I’m not very impressed by his voice. I agree. This was a lot better than I thought it would be. 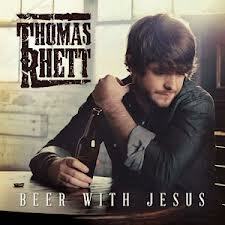 At first I thought it would just be a shallow attempt to work both beer and Jesus into the same song. The arrangement is pleasant and unintrusive, and the delivery sounds very sincere. It’s likely common knowledge by now, but Thomas Rhett is the son of Rhett Akins (“That Ain’t My Truck”). I like both this song and the Wagoner song. Just a different point of view on how we’d act around Jesus, and perhaps a different point of view about what Jesus would truly care about in the first place. PS. This song is quite good. I actually like his voice. It’s rugged, kind of reminds me of Marcel who I like, but has a unique voice. …being one of those guys, who would go hands down for the mars bar rather than meeting jesus, if i was asked to choose – just look at the odds – i cannot deny a funny liking for intelligent/ironical “jesus songs”, sentimental or funny santa claus movies and george burns starring as “god”. but leave me also alone with easter rabbits, unless their name is “harvey” and they’re 6.5 ft. tall. since this one falls nicely into the category “quite intelligent jesus tunes”, i quite like it, even though i was a bit anxiously waiting to hear the line “love your love the most” somewhere in it. I like the song but I agree with OH about his voice which would make me reluctant to ever buy an album of his. While I’m sick of all the current crop of songs mentioning trucks, I still do like “That Ain’t My Truck”. Since you’re reviewing a song about Jesus, I’ll mention a Burr-Shaw song ,”God and Me”, in which they sit down for tea instead of beer. I prefer Victoria Shaw’s original recording to a recent version by Kristen Chenowith. Does anyone else here Reba’s “He Gets That From Me” in here? Just asking. A well written country. A song that is written is mainstream pleasing yet has been wrote in the style of a country song. Amazing! This however is not the only well written country song out there today. The saving grace here amongst other well written mainstream country songs is that neither a loud, car wreck of a production nor the vocals of a screaming/bombastic singer bog down the material. The restrained 90’s country production and gravely, yet subtle, vocal work allow the strong material to shine bright. It’s as if Jesus himself un-plugged his ears, came down and shouted “ENOUGH ALREADY”!!! I’d be excited for the future of Thomas “That Ain’t My Truck” Rhett if his first song weren’t “Something to Do With My Hands”. Maybe mercy will be had on us outcast, traditional country music fans and Thomas Rhett will turn out to be more Chris Young and less Brantley Gilbert, but I’m not holding out much hope for that one. In the mean time though, I’ll put this song into my rotation and hit repeat once and a while. No matter how good this song otherwise might be, I just can’t enjoy it because Thomas Rhett’s voice is not appealing to my ears. I kinda heard a bit of “If You’re Reading This” at certain points in this song, but that’s probably just me. Did the Warren Brothers write this by chance?